New vehicle that to move around Minecraft. 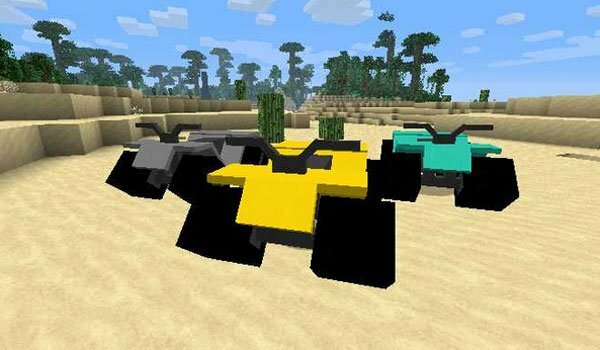 ATV Mod 1.7.2 gives us the option to create our ATV vehicles. The ATV this mod contain are built from several crafted parts and subsequently bind to get the vehicle. There are three types distinguished by the color and the engine of the ATV. If you do an engine with iron you will get the most basic one. Gold would be the one in the middle and the diamond would be the most powerful engine of all. Stay tuned for updates on this mod, as the author may still continue improveing vehicle’s textures, that we will be publishing in our news. How to install ATV Mod for Minecraft 1.7.2? Now you can move through your Minecraft worlds on an ATV!